A broad literature on vulnerability and adaptation has made the case for gender analyses as a fundamental component of both designing programs and projects aimed at addressing the effects of climate change and assessing their impacts. These lessons are apparent in the guidance documents of various donors, including USAID. While the guidance of these and other documents compel both donors and implementing partners to consider the effect of gender considerations on program and project outcomes, there is less guidance on how such considerations are to be identified. As an important aspect of development and adaptation programs, gender analyses have provided empirical evidence for the complex impacts of climate change on livelihoods, as well as the ways in which people mobilize material and social resources available to them to address those impacts. In practice, however, the framings of gender utilized for gender analyses within climate change programs and projects lag behind newer, more nuanced, conceptualizations within the gender and adaptation literature (Carr 2008; Carr and Thompson 2014; Sultana 2013; Demetriades and Edplen 2010; Kaijser and Kronsell 2013). Several pertinent aspects have emerged from this literature that can inform and move the practice of gender analysis forward. First, as an organizing social category for livelihoods, resource allocation, and roles and responsibilities, gender takes meaning from its association with other social categories, such as age, ethnicity, and class. Gender, rather than being an intractable characteristic of individuals, is dynamic and the roles, responsibilities, power relationships, and resources associated with being a man or a woman can vary significantly depending on the situation, even for the same individual. This, in turn, leads to a second important insight - although gender is often an important social cleavage around which vulnerability and adaptation patterns coalesce, other social categories such as age, wealth, caste may be just as or even more important (Carr and Thompson 2014). In practice, therefore, programs and projects endeavoring to accurately understand vulnerability, who is vulnerable to what (Carr 2013), and patterns of adaptation, why and how people respond to perceived vulnerability, must take into account the complexity of gender itself. This entails understanding how gender matters in the context of the activities and stressors addressed by a proposed project or program. The full report is available to download in the right-hand column of this page. 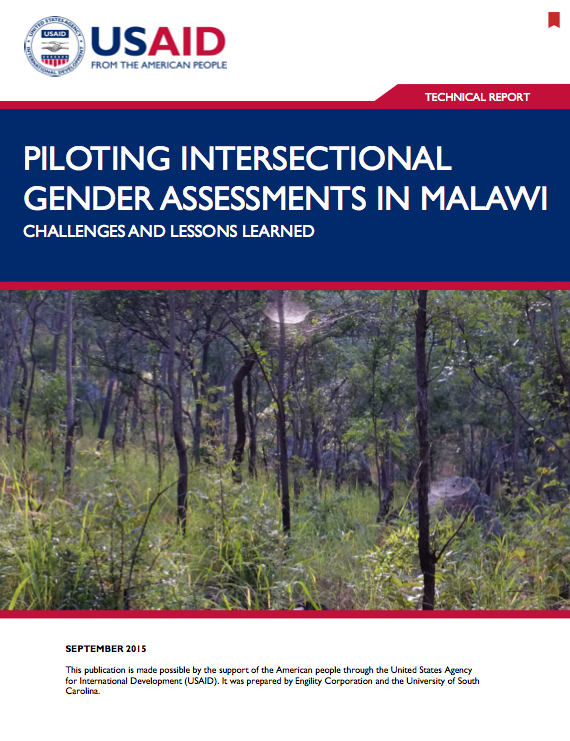 To document the processes, challenges, and opportunities related to conducting an intersectional gender analysis for a project in the process of implementation: The focus was on how gender as an intersectional social category has an impact on the forest use, agricultural practice, and the vulnerability context. To provide useful data to the Performance Evaluation and Reporting for Results Management (PERFORM) project: To this end we sought to understand how community members in the target geographies use available forest resources, land resources (we focused specifically on agricultural use). We also sought to document what community members in the target geographies define as their most pressing livelihood concerns (vulnerability context). This article focuses on the broad lessons learnt from the use of gender intersectional analysis in this pilot stufy. Results regarding the characteristics, livelihood activities, vulnerability concerns and land and forest use of the communities investigated are explored in depth in the report (download in right-hand column) and in this case study. That gender as a social category is mutually constituted with other social categories. Special attention was paid to how other social categories interact with gender within the study site. That the interaction between gender and other social categories can create qualitatively different experiences for individuals embedded within the same context. Here the study focused on how the intersection of gender and other social categories such as migrant status created unique experiences for people as well as differences in rights and availability of resources, roles and responsibilities, status, power and vulnerability. Attention was also paid to whether and how gender was the master social category in determining access to resources. The livelihoods as intimate government (LIG) approach was used to guide the collection of data in the field. LIG focuses data collection on understanding why people make particular livelihood decisions and how this in turn has an impact on observed livelihood outcomes. A full description of LIG can be found in articles published by Carr in 2013 and 2014 (see bottom of page). Those aspects of LIG that shaped the collection of data are discussed in detail in the report. Intersectional methodologies focus on how gender is constituted with other social categories, as well as, how these mutually constituted relationships create qualitatively different experiences for the individuals/groups involved. Therefore, an intersectional gender analysis, in addition to seeking to understand gendered livelihood and vulnerability patterns, has to explicate the processes and mechanisms through which gender operates within the local context. Lessons unique to the implementation of an intersectional gender analysis are listed below, and must be taken into account alongside other guidelines for data collection. A full discussion of each point is given in the report (dowload available in right-hand column). A list of resources on conducting qualitative and participatory gender analysis within the context of programs/projects focused on climate change are given in Appendix A of the report. Intersectional gender approaches are best implemented through qualitative methodologies. Initial fieldwork in intersectional gender approaches is exploratory in nature and cannot be driven exclusively by hypotheses determined beforehand thereby reducing the utility of quantitative methodologies. Iterative data collection processes are an important, perhaps integral, part of any attempt to collect information using an intersectional approach to gender. The types and how questions are asked are critical to the outcome of an intersectional analysis. Data collection for intersectional approaches is as an immersive and intense process. The quality of the research/data collection team is particularly important in the quality of data received. Intersectional gender analyses take time and might not be suited for collection of data for severely time-constrained initial gender baseline analysis/assessments. Data collected from intersectional gender analysis can effectively build on preliminary gender assessments and provide critical information on how gender shapes vulnerability and adaptive capacity within a particular context. It is important for implementers and donors to work with gender analysts to shape gender assessments appropriate to project needs and goals. This study shows that intersectional gender analysis can answer key questions such as what crops are being grown/what resources are being utilized? By whom and how? What are the constraints that people face? How do they respond to these challenges? What is the potential impact for projects? etc. Therefore, it is possible to use intersectional gender approaches to gather the data conventionally used to inform gender baseline studies for projects. Following the LIG approach, the study began by collecting data at an individual level, and rather than being concerned with getting a precise number of men versus women in the sample, the study was interested in interviewing as many people as possible from various categories of possible interest (young men, young women, old men, old women, people who do ganyu, people who have a business). Having such an initial exploratory phase to understand how people live in a particular place provides a broader range of information, giving the researcher/project the flexibility to analyze more social categories and understand how these have an impact on vulnerability in comparison with, or through intersection with, gender. For climate change projects this has the advantage of providing data for identifying both gendered patterns as well as the most vulnerable segments of a particular population. Intersectional gender analyses therefore are capable of contributing to an understanding of gendered patterns in much the same way that conventional gender analyses can, but in addition they provide rigorous assessments of the validity of such divisions of the populations and in-depth explanations for observed patterns. Carr, E. R. 2013. Livelihoods as Intimate Government: Reframing the logic of livelihoods for development. Third World Quarterly, 34(1), 77–108.